Years ago my sister gave me a book about celebrating the holidays through out the year and in it was a little blurp about making Hershey Kiss Roses. No pictures, no illustrations, just a simple paragraph. (I almost missed it.) I tried it and I was sold. That year I made them for everyone I knew and even for people I didn't. And, year after year, every January and February, I always stock up on the supplies so I can make them again. These are the perfect craft. I'm not lying! You can make them quickly. Your kids can help. There is little mess and low cost. And, when you give them away they make people happy! 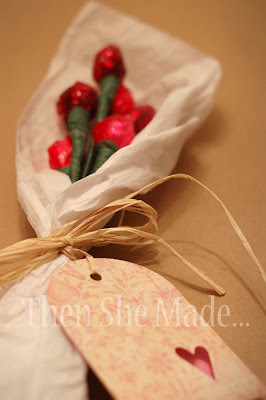 So, as you are gearing up to do your Valentine crafts, keep this one in mind - it's a keeper. And, here's a quick tutorial with pictures. 2- Stack two Kisses on top of each other. (Just turn one upside down and stack the other one on top of it.) Then center the Kisses in the middle of the cellophane. 4- Then use the floral tape to hold the cellophane to the stick and wrap the whole stick so it looks like the stem of a flower. 5- Repeat all those steps until you have as many roses as you need. I've given them out as individual roses, small bouquets and even large ones too. They really work great for gifts for leaders, teachers, friends, and well, anyone! I'm thinking a fun little teacher gift! I love this idea and will definitely be trying something similar! Just found your blog through Be Different Act Normal and read every post!